Serve as a resource person for health education/health and promotion activities. There is a strong interplay between the Public Health Accreditation Board (PHAB) Domains and Health Education Specialist Competencies. 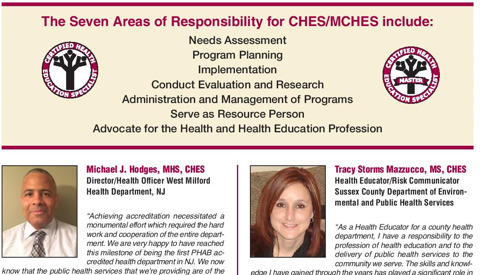 CHES® and MCHES® are well positioned to assist in the work of Public Health Department Accreditation and have the knowledge and skills to lead this effort. Click here to read the full document outlining the similarities between PHAB Domains and Health Education Competencies. Public Health Departments across the country are now seeking accreditation to advance quality and performance within their departments. Many CHES® and MCHES® have been appointed as Accreditation Coordinators to lead this process for state and local health departments across the country. Click here to read the full document outlining ways in which CHES®/MCHES® can assist with Public Health Department Accreditation efforts.